1. Two stations A and B are 252 km apart on a straight line. One train starts from A at 9 a.m. and travels towards B at 36 km/hr. Another train starts from B at 11 a.m. and travels towards A at a speed of 54 km/hr. At what time will they meet? They meet x hours after 9 a.m. They meet at 1 p.m.
2. A shopkeeper sold a book at 25 % discount on the marked price but he gains 10 %. If the marked price of the book is Rs. 550, then find the cost price of the book? 4. A can do a work in 15 days, B can do it in 12 days but C can do (3/4)th of the work in 18 days. Find the time taken by all together to complete the work? 5. P, Q and R started a business by investing Rs. 32000, Rs. 25000 and Rs. 40000 respectively. After 5 months, Q invested Rs. 5000 more but R withdraw Rs. 8000. Find the share of P, if the share of R at the end of the year is Rs. 63600? The following bar graph shows the Income (In lakhs) of two different companies over the years. 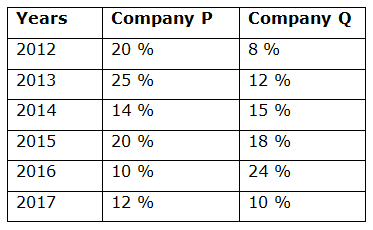 The table below shows the profit % of company P and company Q over the years. 6. Find the total Income of company Q in all the given years together? 7. The total income of company P in the year 2012, 2014 and 2016 together is approximately what percentage of the total income of company Q in the year 2013, 2015 and 2017 together? 8. 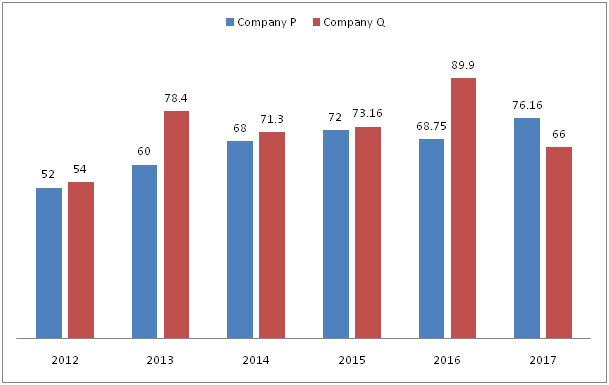 Find the difference between the total expenditure of company P in the year 2013 and 2015 together to that of total expenditure of company Q in the year 2012 and 2014 together? 9. Total expenditure of company P and Q together in the year 2015 is approximately what percentage of total expenditure of company P and Q together in the year 2017? 10. Find the ratio between the total expenditure of both the companies together in the year 2013 to that of the total expenditure of both the companies together in the year 2016? 1) Two stations A and B are 252 km apart on a straight line. One train starts from A at 9 a.m. and travels towards B at 36 km/hr. Another train starts from B at 11 a.m. and travels towards A at a speed of 54 km/hr. At what time will they meet? 2) A shopkeeper sold a book at 25 % discount on the marked price but he gains 10 %. If the marked price of the book is Rs. 550, then find the cost price of the book? 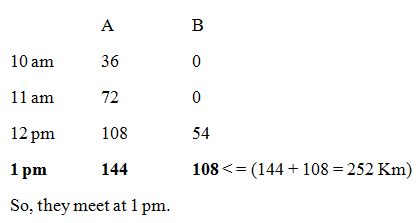 4) A can do a work in 15 days, B can do it in 12 days but C can do (3/4)th of the work in 18 days. Find the time taken by all together to complete the work? 5) P, Q and R started a business by investing Rs. 32000, Rs. 25000 and Rs. 40000 respectively. After 5 months, Q invested Rs. 5000 more but R withdraw Rs. 8000. Find the share of P, if the share of R at the end of the year is Rs. 63600? 6) Find the total Income of company Q in all the given years together? 7) The total income of company P in the year 2012, 2014 and 2016 together is approximately what percentage of the total income of company Q in the year 2013, 2015 and 2017 together? 8) Find the difference between the total expenditure of company P in the year 2013 and 2015 together to that of total expenditure of company Q in the year 2012 and 2014 together? 9) Total expenditure of company P and Q together in the year 2015 is approximately what percentage of total expenditure of company P and Q together in the year 2017? 10) Find the ratio between the total expenditure of both the companies together in the year 2013 to that of the total expenditure of both the companies together in the year 2016?